My jam of choice is ginger and we keep a jar of Fortnum and Mason's rather excellent ginger preserve in the fridge. However when I was preparing my breakfast the other day I found that Steve had finished off the jam and put the empty jar back in the fridge. I resorted to Jif extra crunchy peanut butter (Note 1) with my toast but as I ate it I wondered what would happen if Fortnum's stopped making ginger jam; would the world stop revolving? Would stock markets crash? Would I make my own ginger jam? The first two are inevitable results of a ginger jam crisis but the third... maybe I could avert the crisis single-handedly by creating my own version. My version contains lemons as I wanted to be sure that the jam would set and lemons are naturally high in pectin (the agent that facilitates the setting of jam). As a result my jam is less sweet than Fortnum's and the heat from the ginger is offset by the tartness of the lemons. So far everyone that has tasted it loves it - I hope you do too. Note 1: Thanks to my dear friend Liz in Dallas for keeping me supplied with the only peanut butter brand that I will eat. Note 2: I use jam sugar which has added pectin to "guarantee" a firm set (some guarantee - it still doesn't always set first time!). However normal granulated sugar should work too. If the jam doesn't set you can troubleshoot as detailed in point 17 in the method below. The first step is to sterilize the jar. Set your oven to 140 degrees centigrade. Now wash your jar in soapy water and rinse in clean warm water. Leave it to drip-dry, upside down, on a rack in the oven for at least half an hour while you make the jam. Using a sharp knife remove the zest from the lemons in strips taking care to avoid the white pith. Cut each strip into thin slices. The size of the slices is up to you. Think about it in terms of marmalade and whether you like thin, medium or thick cut shreds. Place the sliced zest in a small saucepan. Add the bicarbonate of soda and water. Heat the contents of the pan on a high heat and bring to the boil. Reduce the heat to low and let the contents simmer for five minutes or until the peel has softened. Remove the pan from the heat and leave to one side. Returning to the lemons, cut away the white pith to expose the lemon segments. Now, work over a large bowl and cut away the membrane. Place the remaining lemon segments in the bowl but take care to remove any seeds. Place the lemon segments and juice in the pan with the lemon peel and water. Add the grated ginger and liquid pectin to the pan and stir well. Heat the pan over a high heat and bring the contents to a boil stirring constantly. Add the sugar and stir again. Keep the contents of the pan boiling furiously such that they are bubbling and rolling. It is essential to keep stirring at this point to stop the contents of the pan burning. when the liquid jam has reached 105 degrees centigrade. You can test this using a confectioner's thermometer (aka sugar or candy thermometer). From experience I recommend investing in an electronic one for accuracy but only if you are likely to use it regularly. place a large drop of jam on a cold plate and place the plate in the refrigerator. Remove the pan from the heat during this test as you don't want the liquid jam to burn. Once the jam on the plate has cooled (should be no more than 2-4 minutes) push the jam with your finger. If the surface wrinkles and the jam doesn't overflow where you pushed it it has reached setting point. I use a combination of the two methods; I use a thermometer to monitor the temperature. Once the liquid jam has reached 105 degrees centigrade I do the plate test. Once the jam has reached setting point ladle it into the sterilized jar. Close the jar and leave it to cool. there was not enough pectin in the mixture to achieve a set. Lemons are very high in natural pectin and it is unlikely that this recipe does not have enough pectin so I would reboil the jam to try to achieve setting point. Only if this fails again would I add more liquid pectin. If you add too much pectin your jam may end up with too firm a set. I love Ginger. Kind of a mature passion.as in, I'm in my mature age. : o )As I read your post I realised that I have never had Ginger jam.oh my God! This asks for a true.and it will be your recipe. Even before I get F & M's.i s hall report back. I have never tried ginger jam before. This one sounds and looks yummy! I love your blog Reena, great work! Hi Jacob. The jam is normally eaten within a month in our house so I can't give you a firm date. However it should easily last 3-6 months if stored properly. A bit of research resulted in the following guidelines. For best results, store freshly made jams in a cool, dry place. This applies only to jars which are filled to the rim; half filled jars must be stored in the fridge once cool. Unopened jams should keep for up to 12 months from the day of making. All jams must be stored in the fridge upon opening. 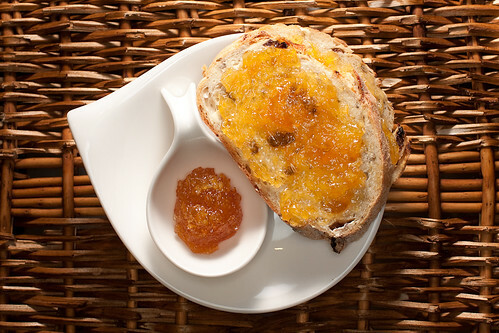 Once opened, jams and marmalades have been exposed to air and are subject to mould and oxidisation. If the jam does become mouldy you must discard the entire jar. Yum!! Thank you for this recipe :) I made this jam recently and it is a winner!! I added two finely shredded kaffir lime leaves at the end and it gave the jam a further interesting kick. Delicious!